In the span of one day, Nick Sandmann became an online sensation. 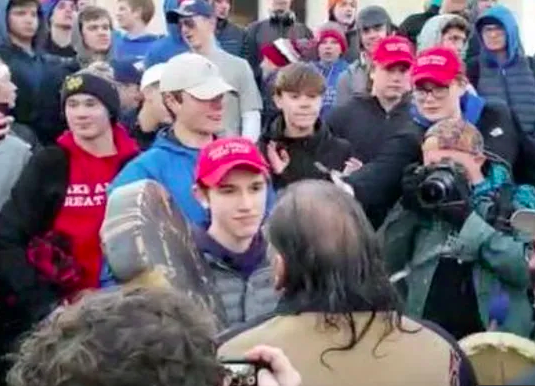 You might know Sandmann as the young boy sporting the red “Make America Great Hat,” engaging in a face-off with Nathan Phillips, an advocate for the Lakota people and an Native American elder. While this 17 year old offers no special qualities, he has now become a symbol for the young generation supporters of Donald Trump. Here’s a brief recap of the video that has captivated the country for the past week: Sandmann and his fellow classmates, coming from Covington Catholic High School in Kentucky, had just finished attending an anti-abortion rally and were waiting on the steps of the Lincoln Memorial. The video then shows Phillips banging on a drum as Sandmann stands directly in front of him, smirking. Something you might have missed when you watched the video was after a couple of minutes, one of Sandmann’s friends gets into an argument with another Lakota advocate. In the video, Sandmann can be seen looking towards the friend, urging him to stop and then giving up and walking away. Although Sandmann now claims that he was trying to prevent a situation instead of cause one, it is clear from the video that he had simply fallen victim to something we have all experienced at some point in our lives: trying to look cool. Surrounded by his boy band of fellow students, Sandmann could hear the laughs and hollers in the background, urging him to keep going. However, once he could see that there really was trouble stirring between one of his friends and the Native, the regret started to sink in. Now, I want to be clear: I am not on Sandmann’s side. I do not agree with the values that these boys have, nor do I think it was appropriate for Sandmann or the group of boys stand in front of Phillips and the other protesters while they were peacefully chanting. What I’m pointing out is the problems that occur with this group mentality. Each boy appears to be wearing a “Make America Great Again” hat, even though some of them might not actually support Trump’s values. Sandmann was also not the only one to cause a spectacle of himself in order to look cool. In the video, one of students appears to take off his shirt and swing it around, while the rest of the boys mosh pit around him. The group mentality caused the boys to feed off of each other’s actions, encouraging each other to act foolishly despite the consequences. These boys will no longer be looked at for who they are individually but by how they wanted to appear in front of their boys. I believe that these actions are a direct result of having a president who also takes no responsibility for his actions. When the person who is supposed to be the biggest role model in the country is constantly tweeting and violating anyone who differs from himself, it is easy for people, especially adolescents, to take their freedom of speech for granted.